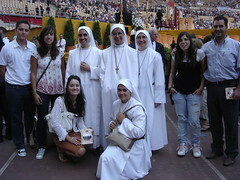 On the 18th of September, the community of the Servant Sisters of Alcalá de Guadaíra attended the beatification of Mother María de la Purísima, who was a Sister of the Cross, which took place in the Olympic Stadium in Seville. We went to the event accompanied by a small group of the Home of the Mother Youth including Esmeralda and Felix Manuel who would be married the next day. We joined the bus that went from the Immaculate Conception parish, where we give catechism classe, and in which some of our young friends from Caritas (a charity movement) went. 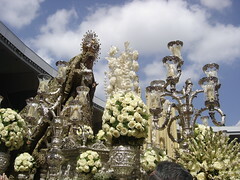 At 3:00 am, the image of the Esperanza Macarena had left the basilica in procession to go to the stadium. It was the first time she had left the historical part of Seville and crossed the Guadalquivir. Her entry into the stadium was very impressive. The applauses accompanied her along her route. The image presided over the solemn ceremony. 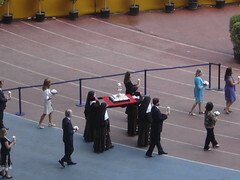 A statue of Saint Angela de la Cruz (the foundress of these Sisters) was to the right of Our Lady, and the image of the new Blessed, which they uncovered during the ceremony, was to the left. 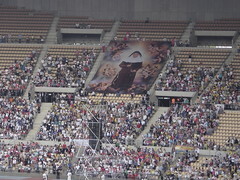 On the lawn of the stadium, in front row as they deserved, there were about five hundred Sisters of the Cross who sang a song to the Virgen Macarena. 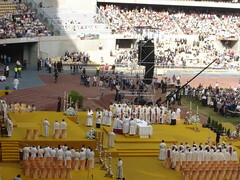 The Mass was presided by the Prefect of the Congregation for the Causes of Saints, Archbishop Angelo Amato, the envoy of Pope Benedict XVI for the beatification. Next to the Prefect, were the Archbishop of Seville, Juan Jose Asenjo Pelegrina, the Pope's nuncio in Spain, Archbishop Renzo Fratini, the nuncio in Romania, Javier Lozano, the cardinals Amigo Vallejo, Rouco Varela, García Gasco, and many bishops and priests. A touching moment was when Madre María de la Purísima was proclaimed a blessed. There was a burst of applause accompanied by a shower of petals and the ringing of the bells of the Giralda, which were broadcast live on stadium screens. Four Sisters of the Cross were the ones that carried the relics of the new Blessed, whose feast day will be celebrated on October 31st, the date of her death. Mother María de la Purísima (María Isabel Salvat Romero), was born in Madrid in 1926 and left her wealthy family when she was eighteen to enter the Sisters of the Cross. She was the Mother General threes times from 1977, until she died in 1998. Archbishop Angelo Amato began his homily with these words: "Today, the Olympic Stadium in Seville is a great church, a great cathedral, the second Cathedral of Seville. 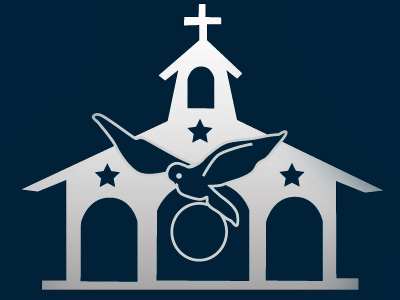 Here the best athletes in the world compete, and now we contemplate the athletes of holiness." And at the first reference that he made to the Sisters of the Cross, all the attendees broke into an endless applause that was seconded by the Prefect himself standing up. In imitation the cardinals, bishops and the whole entire stadium stood up and there was a prolonged applause for several minutes. As was obvious, the only ones who remained seated were the Sisters of the Cross. 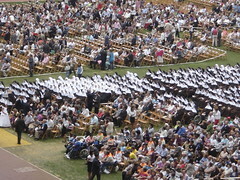 The Archbishop of Seville, Jose Asenjo, said that the Sisters of the Cross, "with their poor coarse sackcloth, are the admiration of Seville and all the towns of Andalucia, Spain, Italy and Argentina where they have their houses because they live the Gospel in a pure way, with all its beauty and radicality." Archbishop Amato said that the new Blessed was like her predecessor Saint Angela de la Cruz, saying that they were "two great benefactors of the city," that they took the "Cross of Christ through the streets of Seville, each and every day of their lives, as a vocation to holiness and apostolate for the poor and needy. " During the homily, Archbishop Amato told some anecdotes of the Blessed, like the one in which she healed the wounds of a completely abandoned old woman who had mice climbing all around. Mother María wanted to avoid this difficult situation for a young woman who accompanied her. She cleaned the house alone and drove out the rodents. Her attitude was truly heroic, because she was horrified of mice. he Prefect also spoke of her heroic strength, "especially during her years as the Mother General, in the difficult post-conciliar period, she persevered in the healthy tradition, indicating the path of holiness and service desired by the foundress, and rejecting the external changes." "This ability to preserve intact the spirit of the Institute, made her congregation flourish in a truly extraordinary way." "In times of great ideological turmoil, she contributed to strengthening the spirit and charism of the foundress. Despite the devastating currents of religious life, she knew how to maintain her sisters together through the exact observance of the Holy Rule and the spirit of prayer." The Prefect referred to the testimony of a sister who tells about the many humiliations they had to suffer when they attended classes in theology: "We came to class with our blue cardboard folder, with our worn shoes and with our big, broken umbrella. While we were looking for a seat we felt the stares of disapproval from some religious sisters who whispered: "The ones from the Old Testament have come." I felt bad and looked at her, who, however, continued smiling and serene before these comments." Another sister said that Mother María de la Purísima smelled of bleach when she was superior of the house of Mines. Asking why, the portress sister replied: "Dear sister, the Superior does the least pleasant tasks of the house." Because Mother María de la Purísima used to say that in the house of God there are no low tasks, all are high tasks. In the ceremony the girl, Ana Maria Rodriguez Casado, whose cure was attributed to Mother María de la Purísima when she was three and a half, received her First Holy Communion. The girl was born without the inferior vena cava and with congenital heart disease. Archbishop Angelo Amato expressed to end off, that "Seville is a city of grace, but this event has made it become the city of divine grace." And so, with a cheerful and grateful heart, we returned to Alcalá wanting to imitate the new blessed and be as well, each in our place, "athletes of holiness."